Banksy's Nativity scene painted in 2003 and believed to be owned by Robby Williams is doing the rounds on the internet again this year. Banksy is notorious for his satirical images that have gained him international recognition. This scene depicts Joseph and Mary blocked from getting to Bethlehem by the Isrealie West Bank Barrier, pure genius! Banksy’s Nativity scene painted in 2003 and believed to be owned by Robby Williams is doing the rounds on the internet again this year. Banksy is notorious for his satirical images that have gained him international recognition. 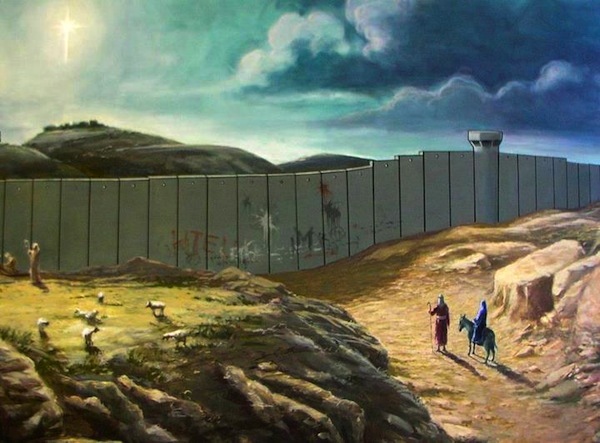 This scene depicts Joseph and Mary blocked from getting to Bethlehem by the Isrealie West Bank Barrier, pure genius!